The B.C. New Democratic Party is furious after learning that the provincial Liberal government passed an Order in Council on Feb. 16 that exempts the province’s six WHL teams from minimum wage legislation. . . . “The government did it, essentially, in secret and they’ve thrown out the Employment Standards Act, the law, in order to satisfy a small group of employers,” Shane Simpson, the NDP’s spokesperson on jobs, labour and skills, told Marty Hastings of Kamloops This Week. . . . Simpson added: “It’s also concerning that between the owners of the teams, they gave over $200,000 to the Liberals in donations. It’s a decision that was done quietly behind closed doors by the look of it.” . . . In a news release, the NDP pointed out: “Collectively, five of the six team owners . . . have donated in excess of $200,000 to Christy Clark’s B.C. Liberal Party.” . . . The news released carries this headline: Clark quietly rewards donors with minimum wage exemption for young hockey players. . . . In his story, Hastings points out that “Tom Gaglardi is majority owner of the Kamloops Blazers Hockey Club, which has made two donations totalling $2,900 to the B.C. Liberals since 2005, according to Elections BC. Sandman Hotels, owned by the Gaglardis through the family’s Northland Properties company, has made 27 donations totalling $109,875. Sandman also donated $300 to the NDP.” . . . Hastings’ story is right here. 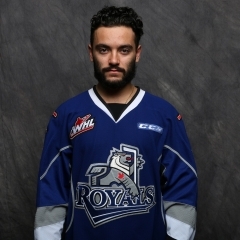 While at Tuesday’s game between Victoria and the host Kamloops Blazers, someone mentioned that Royals F Matt Phillips wasn’t on the WHL team that will play a travelling Russian side on Nov. 7 and 8 in Prince George and Edmonton. . . . I didn’t believe him, until I checked the roster, that is. . . . If the 5-foot-6 Phillips isn’t the best forward in the WHL, he at least is in the conversation. It really is this simple: If Phillips isn’t on the roster, the WHL isn’t icing its best team. . . . Of course, Phillips likely will be a late addition to the roster, what with those responsible having named two injured players to the roster in F Dillon Dube (knee) of the Kelowna Rockets and Nolan Patrick (sports hernia surgery) of the Brandon Wheat Kings. . . . Still, being named as an injury replacement isn’t the same as being selected to the original roster. But why do I think that Phillips, who was a sixth-round pick by the Calgary Flames in the NHL's 2016 draft, will use that slight as more fuel for the fire that burns inside him? 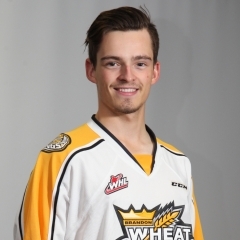 The Brandon Wheat Kings have placed F Duncan Campbell, 20, on waivers as they got down to the maximum of three 20-year-olds on their roster. They will go with G Jordan Papirny, F Reid Duke and F Tyler Coulter. . . . Campbell, who is from Brandon, was pointless in six games this season. Last season, he had 10 goals and 12 assists in 72 games, after putting up 12 goals and nine assists in 68 games as a freshman in 2014-15. . . . If Campbell clears waivers, he will be a free agent. F Ryan Graham, who has yet to play this season due to an undisclosed injury, is back practising with the Saskatoon Blades. He might get into the lineup at some point this weekend. . . . Graham had 22 goals and 24 assists in 71 games last season. . . . Graham’s return will leave the Blades with four 20-year-olds, so something will have to give. The others are F Kolten Olynek, D Bryton Sayers and F Jesse Shynkaruk. The Hockey Canada pooh-bahs gathered in Calgary on Monday and Tuesday to hear bids from cities wanting to play host to the 2019 World Junior Championship. . . . There are believed to have been five presentations. Vancouver and Victoria made a combined presentation, as did Saskatoon and Winnipeg, Calgary and Edmonton, and London, Ont., and Windsor. As well, a group from Ottawa made a presentation. . . . TSN’s Darren Dreger reported that former NHL/WHL D Chris Phillips and Wade Redden were part of the Ottawa presentation. . . . Hockey Canada didn’t release any information on the presentations; in fact, it didn’t confirm who was involved in the presentations. . . . An announcement awarding the tournament to one of the groups is expected in late November or early December. . . . The 2017 tournament is scheduled for Montreal and Toronto, with the 2018 event in Buffalo. If you’re wondering what’s happening in the KHL, Patrick Conway of Conway’s Russian Hockey Blog has a team-by-team update right here. At Edmonton, D James Shearer broke a 2-2 tie at 2:23 of the third period and the Brandon Wheat Kings, despite being outshot 45-16, went on to beat the Oil Kings, 5-3. . . . Shearer has two goals this season. . .
. Brandon led this one 2-0 before it was five minutes old, with F Tanner Kaspick getting his ninth goal at 1:27 and F Stelio Mattheos getting his fourth, on a PP, at 4:48. . . . The Oil Kings tied it when F Kole Gable scored his first goal, at 19:33 of the second period, and F Trey Fix-Wolansky got his fifth, at 1:43 of the third. . . . D Kale Clague added insurance for Brandon at 10:53. . . . That turned into the winner when F Lane Bauer got his fifth goal for Edmonton, at 18:29, with G Liam Hughes out for the extra attacker. . . . Brandon F Tak Anholt got the empty-netter at 19:46. . . . Clague also had two assists. He returned to the Wheat Kings from the camp of the NHL’s Los Angeles Kings with an injury and has played only three games. He has two goals and seven assists. . . . F Ty Lewis added three assists for Brandon, while Shearer also had an assist. . . . Fix-Wolansky had an assist for Edmonton. A 17-year-old freshman from Edmonton, he’s got five goals and seven assists in 12 games. . . . Brandon G Jordan Papirny, who is from Edmonton, stopped 42 shots. . . . Hughes turned aside 11. . . . The Wheat Kings (6-3-2) have points in five straight (4-0-1). . . . The Oil Kings (4-6-2) are 1-1-1 in their last three. . . . The Wheat Kings were without F Tyler Coulter, 20, as he completed a two-game suspension. . . . They also were without two other 20-year-olds — they have waived F Duncan Campbell, while F Reid Duke was scratched following the death of an uncle. . . . Announced attendance: 5,643.
to a 2-1 victory over the Blazers. . . . Hannoun scored his fifth goal of the season 49 seconds into the third period, redirecting a point shot by D Chaz Reddekopp past G Connor Ingram. . . . The Blazers took a 1-0 lead on D Conner McDonald’s first goal, a PP score at 3:31 of the second period. . . . Victoria F Jack Walker’s eighth goal tied the score at 4:45 of the second. . . . Walker also had an assist. . . . The game offered up a terrific goaltending duel. 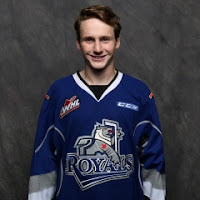 Griffen Outhouse of the Royals blocked 33 shots, four fewer than Ingram. . . . The Blazers held an 11-6 edge in shots in the first period. However, Victoria outshot the Blazers 33-23 over the last two periods, including 17-8 in the third. . . . Kamloops was 1-4 on the PP; Victoria was 1-5. . . . The Royals improved to 8-6-0. . . . The Blazers (7-7-0) had a three-game winning streak end as they lost at home for the first time in six games. . . . D Joe Gatenby of the Blazers sat this one out with a one-game suspension. . . . The Blazers continue to be without D Dallas Valentine (elbow). . . . Announced attendance: 3,153. That is the fifth-smallest regular-season crowd in the history of the Blazers’ home arena, which opened in the fall of 1992. Warriors, 6-2. . . . Warriors F Brett Howden scored his ninth goal 14 seconds into the first period. 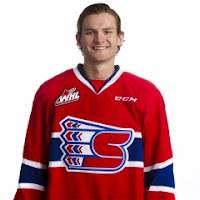 However, he left the game midway through the first with an undisclosed injury. . . . Spokane D Jeff Faith tied it with his first goal, 26 seconds into the second period, and F Hudson Elynuik’s second goal, just 42 seconds later, made it 2-1. . . . F Kailer Yamamoto upped the lead to 3-1 at 3:25 with his eighth goal. . . . With that, the Warriors changed goaltenders, Brody Willms coming in for Zach Sawchenko. . . . F Nikita Popugaev got the Warriors to within one, his ninth goal coming just 14 second after the goaltending change. . . . But the Warriors couldn’t equalize. . . . F Keanu Yamamoto (3), F Tanner Wishnowski (2) and Elynuik had third-period goals for the Chiefs. Yamamoto scored 46 seconds into the period and Wishnowski got his goal at 1:27. . . . The Warriors obvious had some early-period issues. . . . Kailer Yamamoto added two assists to his goal, while Keanu Yamamoto, Wishnowski and Elynuik each had one. . . . G Jayden Sittler stopped 19 shots for the winners. . . . Sawchenko gave up three goals on 10 shots. Willms came on to stop 18 of 21 shots. . . . Spokane was 1-7 on the PP; Moose Jaw was 0-4. . . . The Chiefs (4-6-2) had lost their previous two games on their East Division swing. . . . Announced attendance: 3,187. 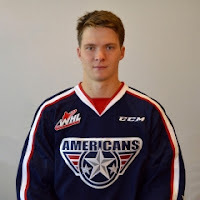 Winterhawks, 4-3. . . . Lukin, who has eight goals, broke a 3-3 tie at 13:53 of the third period. . . . D Kurtis Rutledge gave the Americans a 1-0 lead with his first goal, at 13:53 of the first period. . . . F Keegan Iverson, playing in his 250th regular-season game, scored his sixth goal, on a PP, to pull Portland even at 15:27. . . . Lukin’s PP goal, at 7:57 of the second period, and a score by F Parker AuCoin, at 8:34, gave Tri-City a 3-1 lead. . . . The Winterhawks tied it on goals from F Evan Weinger, his fifth, at 19:42 of the second, and F Cody Glass, his seventh, at 2:37 of the third period. . . . D Juuso Valimaki had two assists for Tri-City, while AuCoin added an assist to his goal. . . . Glass, a sophomore, also had an assist. He has seven goals and 14 assists in 14 games this season. . . . The Americans (8-5-1) have points in each of their last three games (2-0-1). . . . The Winterhawks (8-6-0) have lost three in a row. . . . With the Winterhawks up against Game 1 of the World Series and the Portland Trail Blazers’ home-opener, the announced attendance: 2,202. That is the smallest regular-season crowd in Portland since Oct. 20, 2010, when an announced crowd of 1,666 watched the Winterhawks beat the Everett Silvertips, 2-0. Prince George vs. Kootenay, at Cranbrook, B.C., 7 p.m.
Spokane at Saskatoon, 7:05 p.m.